For the television series, see La Petite Patrie. Saint-Ambroise Church, on Beaubien Street. The area is bounded on the west by Hutchison Street, to the north by Jean Talon Street, to the south by the Canadian Pacific Railway tracks and to the east by Papineau Street. La Petite-Patrie is named after the novel La Petite Patrie by Claude Jasmin, published in 1972, which was adapted into television series (La Petite Patrie) shortly after. Originally a working class neighbourhood, Petite-Patrie began to gentrify in the early twenty-first century. 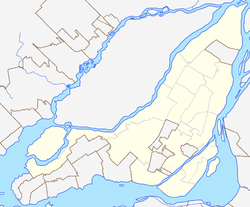 Until the late nineteenth century, La Petite-Patrie was mainly agricultural, with the exception of limestone quarries which were located where Père-Marquette Park is today. The construction of a tramway in 1892 linking downtown to the Sault-au-Récollet led to the urbanization of the area, which continued until about 1930. It was still a predominantly residential neighborhood: the only jobs were concentrated along the railway, in the workshops of Montreal or those of the Montreal Street Railway. The area includes several ethnic communities, including an Italian community, a Vietnamese community and a Latin American community. St-Dominique Street (just east of Saint Laurent Boulevard). The Youth Division of the Court of Quebec located on Bellechasse Street. The Montreal Public Libraries Network operates the La Petite-Patrie library and the Bibliothèque Marc-Favreau, which opened in December 2013. Père-Marquette Park has soccer and baseball fields, playground equipment, community gardens and a skatepark. La Plaza Saint-Hubert is an shopping district located on Saint-Hubert Street between Bellechasse Street and Jean Talon Street. Church of the Madonna della Difesa. ^ "Par bibliothèque | Par arrondissement." Montreal Public Libraries Network. Retrieved on December 8, 2014. ^ "" > Retrieved on May 6, 2015. This page was last edited on 7 February 2019, at 01:09 (UTC).